WASHINGTON — The Republicans' razor-thin margin for driving their sweeping tax package through the Senate was thrown into jeopardy Thursday when GOP Sen. Marco Rubio declared he would vote against it unless negotiators expand the tax credit that low-income Americans can claim for their children. He told CBS News that he has concerns about child tax credits, and he has relayed his concerns to leadership and the tax bill conferees. Specifically, Rubio wants Congress to increase the refundability of the child tax credit for working families. If they don't change it, then he says, they obviously don't need his vote. Rubio and Utah Sen. Mike Lee are the two GOP senators fighting for this change. The Florida Republican complained over Twitter that negotiators could find the money to increase tax cuts for million-dollar earners, but not for families making $40,000 a year. Rubio's potential defection complicates Republican leaders' goal of muscling the $1.5 trillion bill through Congress next week, handing President Donald Trump his first major legislative victory by Christmas. Senate Republicans could still pass the package without Rubio's vote, but they would be cutting it extremely close. An original version was approved by only 51-49 — with Rubio's support. The co-sponsor of Rubio's proposed change, Republican Sen. Mike Lee of Utah, is undecided on the overall bill and pushing to make the credit as generous as possible, said Lee spokesman Conn Carroll. The Senate turmoil came on the same day that a key faction of House Republicans came out in favor of the bill, boosting its chances. Members of the conservative House Freedom Caucus predicted that the vast majority of their members would support the package. The developments came a day after House and Senate Republican leaders forged an agreement in principle on the most sweeping overhaul of the nation's tax laws in more than 30 years. The package would give generous tax cuts to corporations and the wealthiest Americans, and more modest tax cuts to low- and middle-income families. Confident Republican leaders predicted swift passage next week, sending the bill to Mr. Trump for his signature. At the White House, Mr. Trump said he was confident that Rubio will get onboard. "He's really been a great guy and very supportive. I think that Senator Rubio will be there," said the president, who belittled Rubio during the Republican presidential primaries, calling him "little Marco." The tax package would increase the child tax credit from $1,000-per-child to $2,000. The bill makes a portion of the credit — $1,100 — available to families even if they owe no income tax. They would receive the money in the form of a tax refund, which is why it is called a "refundable" tax credit. Rubio wants to increase this amount but wouldn't say by how much. "Given all the other changes they made in the tax code leading into it, I can't in good conscience support it unless we are able to increase the refundable portion of it. 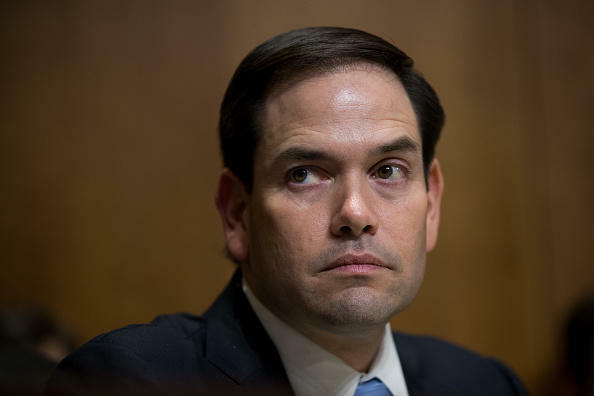 And there's ways to do it, and we'll be very reasonable about it," Rubio said. During debate on the Senate version of the bill, Rubio offered an amendment that would have made the entire $2,000 credit available to families, even if they owe no income tax, but it was soundly defeated. To pay for the expanded credit, Rubio proposed to slightly scale back a steep cut in the corporate income tax rate. Sen. Rob Portman, R-Ohio, said Senate negotiators got the best deal they could on the overall child tax credit. House GOP negotiators were proposing a $1,600 tax credit. "We won everything in the child tax credit," Portman said. When asked if it could be changed further to appease Rubio, Portman said, "We've already won. I mean, we should celebrate our victory." Rubio's opposition comes at a bad time for Senate Republicans, with two of them missing votes this week because of illness. John McCain of Arizona, who is 81, is at a Washington military hospital being treated for the side effects of brain cancer treatment, and 80-year-old Thad Cochran of Mississippi had a non-melanoma lesion removed from his nose earlier this week. GOP leaders are hopeful they will be available next week. The tax legislation would cut the top tax rate for the wealthiest earners — Mr. Trump among them — from 39.6 percent to 37 percent. The package would nearly double the standard deduction, to $24,000 for married couples. But it would scale back the deduction for state and local taxes, allowing families to deduct only up to a total of $10,000 in property and income taxes. The deduction is especially important to residents of high-tax states such as New York, New Jersey and California. Business owners who report business income on their personal tax returns would be able to deduct 20 percent of that income. The agreement also calls for repealing the mandate under the "Obamacare" health law that requires most Americans to get health insurance, a step toward the ultimate GOP goal of unraveling the law. The business tax cuts would be permanent, but reductions for individuals would expire in 2026 — saving money to comply with Senate budget rules. In all, the bill would cut taxes by about $1.5 trillion over the next 10 years, adding billions to the nation's mounting debt. The tax package is polling badly among the public, but Republicans say that will turn around after Americans see the benefits. "The results are going to be what sells this bill, not the confusion before it passes," said Speaker Paul Ryan, R-Wis.
CBS News' John Nolen contributed to this story.